A large number of public parks and lakes in Austin provide opportunities for free outdoor recreation, serving as popular spots for swimming, boating, hiking, and biking. Many free festivals and events are held in the city throughout the year, and major public art installations are on view temporarily or semi-permanently at many sites throughout the city. 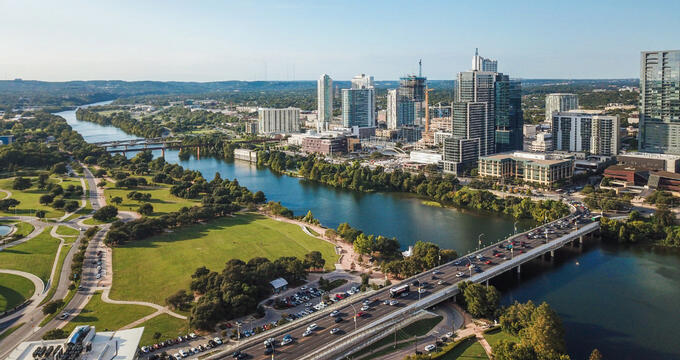 For a lower-cost option to explore some of the city's most unique landmarks, Austin's CapMetro system offers bus, paratransit, and commuter rail lines with stops throughout the city's eclectic and vibrant neighborhoods. Some attractions are free only on certain days – please check before you go. The Blanton Museum of Art is Austin's premiere art museum and one of the United States' largest university art museums, located on the University of Texas campus. The museum was originally founded in 1963 and moved to its current location at the Mari and James A. Michener Gallery Building in 2006. Today, it houses a collection of 18,000 artworks from the ancient era to the present day, with a focus on European paintings prior to 1900, ancient Greek and Roman vases, and more than 4,000 pieces of contemporary and modern art from the Americas. Art is showcased in permanent and temporary rotating exhibitions, which may be viewed for free as part of the museum's third Thursday program. Each third Thursday, the museum remains open until 9:00pm, offering a full slate of free programming to visitors, including gallery talks, pop-up exhibitions, and a Community Conversations series. Free parking is available at university garages for stays under 30 minutes, with several Cap Metro bus lines servicing the university campus. 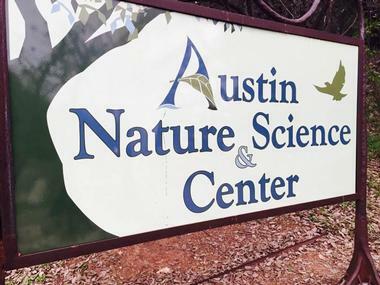 Austin Nature and Science Center is one of Austin's premiere family-friendly science centers, open to the public for free seven days a week during the morning and afternoon hours. 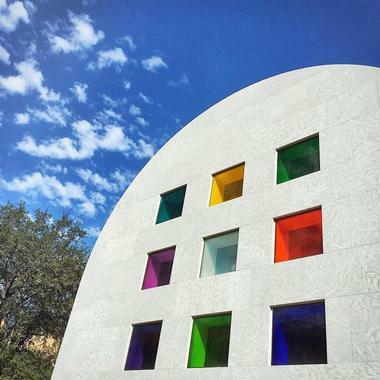 The center was opened to the public in 1960 to provide supplemental environmental education for Austin's youth and increase public awareness and appreciation of nature. It is located along the western end of Zilker Park within the Zilker Nature Preserve, offering a number of indoor and outdoor exhibits for visitors and school groups. Exhibits at ANSC's Visitor Center include a Naturalist Workshop, which lets young visitors examine natural specimens, and a walkthrough cave model. Outside, orphaned and injured animals are cared for in natural habitats, while an Eco-Detective Trail offers informational nature displays and a Dino Pit lets children dig for fossils with child-sized paleontology equipment. The Bullock Texas State History Museum details the social and cultural history of the state of Texas, opened to the public in April of 2001. The non-collecting museum showcases a variety of rotating exhibits and artifacts on loan from other museums, with three floors of exhibits arranged around the concepts of "land," "identity," and "opportunity" and how they relate to the story of Texas' development. Notable artifacts on display include recovered artifacts from the 17th-century La Belle shipwreck, the original Goddess of Liberty statue from the state capitol building, and an authentic NASA console loaned from the Manned Flight Center. The museum offers free admission for visitors of all ages on the first Sunday of each month between 12:00pm and 5:00pm. For an additional ticket charge, film presentations are offered at the museum's Spirit Theatre, which presents the interactive documentary films Star of Destiny and Wild Texas Weather, and at the museum's 3D IMAX theater. The Austin Aqua-Dome is a unique marine animal and supply store that offers central Texas' largest selection of marine corals and fish species. The store is open to the public Tuesdays through Sundays during the afternoon and early evening hours, originally constructed in 1986 as a branch of the Pier One Imports Tropical Fish Stores franchise. Since 1997, it has been operated as an independent marine supply store, showcasing rare and exotic fish species imported directly from the Philippines, Sri Lanka, Bali, and other South Asian and Polynesian areas. 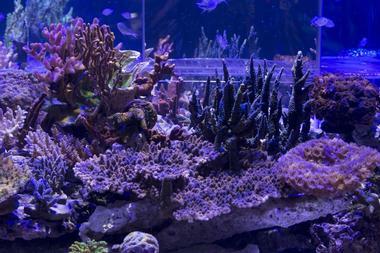 Corals are also imported from Jakarta, Kupong, and other island areas, with a wide selection of pond plants, koi, feeder fish, shrimp, and other marine supplies available. The Aqua-Dome is a great place for families to visit, with a structure similar to an aquarium and koi and goldfish feeding opportunities available for children during the spring and summer months. 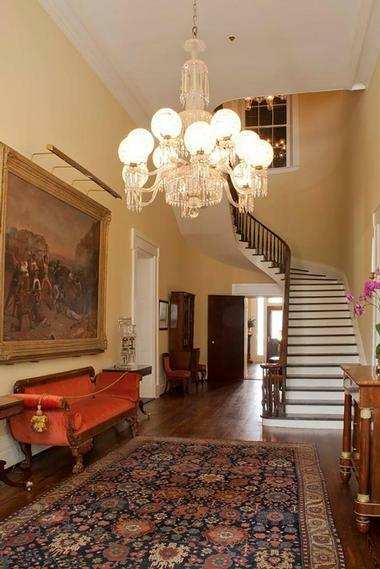 The Texas Governor’s Mansion has been the official residence of every Texas state governor since 1856, making it the state's oldest continually-inhabited residence and the nation's fourth-oldest governor's residence. The 8,920-square-foot Greek Revival-style mansion was originally constructed in 1854 by architect Abner Cook and was designated as a National Historic Landmark in 1974. Free tours of the mansion are offered on Tuesday, Wednesday, and Thursday mornings, lasting approximately 20 minutes and exploring the mansion's public rooms and grounds. Docents elaborate on the mansion's history and architecture, detailing the careers and legacies of past gubernatorial residents. Visitors should note that tours must be scheduled at least one week in advance due to necessary security clearances for touring the building. Several nearby parking garages offer free parking for limited spans of time, with metered street parking also available in the area. 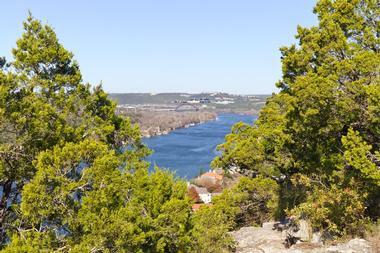 Mount Bonnell is a popular natural viewpoint overlooking Lake Austin and the Colorado River, providing spectacular panoramic views of the Austin skyline and the city's surrounding hills and valleys. At a height of 775 feet above sea level, the mount is commonly thought of as the highest point within Austin city limits, though nearby Mount Barker surpasses its height at 840 feet. The mount is believed to have been named for newspaper magnate George W. Bonnell, though some historians believe it may have instead been named for Texas Army Captain Joseph Bonnell, a key figure in the state's fight for independence. In 1969, the mount was listed as a Texas Historic Landmark, and in 2015, it was added to the National Register of Historic Places. A series of 102 stairs provide easy visitor access to the top of the mount, with a view deck and pavilion offered at the top for picnics and relaxation. The Austin Fire Museum is a free public museum located within the city's historic Central Fire Station No. 1, a two-room firehouse originally constructed in 1938. 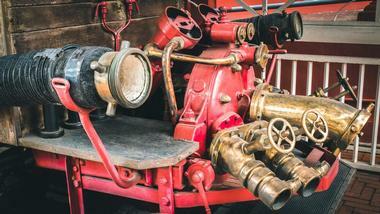 The museum is operated by the Austin Fire Museum Hook and Ladder Society and is open to the public Saturdays and Sundays from 12:00pm to 5:00pm, displaying a wide variety of artifacts related to the operation of Austin's fire department from the 19th century to the present day. Major artifacts on display include an 1870s-era Hook and Ladder No. 1 lantern, historic uniform pieces worn by firefighters in the 19th and early 20th centuries, and memorabilia related to the state's first African-American firefighters. Central Fire Station No. 1 is also home to several currently-operating fire stations, which may be explored as part of guided tours scheduled in advance. 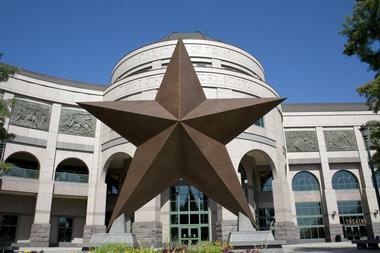 The Harry Ransom Center is a major library archive and museum located at the University of Texas at Austin, holding world-renowned collections of literary artifacts and volumes from Europe and the United States. The collections that would eventually comprise the Center's holdings were originally acquired by Harry Ransom, the founder of the university's Humanities Research Center, in 1957. 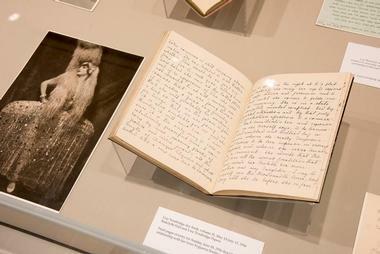 Today, the Center is home to more than 36 million significant literary manuscripts, along with major collections of rare books, photographs, and classic and contemporary works of art. Prominent works held within the collection include a rare Gutenberg Bible and Nicéphore Niépce's View from the Window at Le Gras, known as the world's oldest photograph. Students and visitors may access the library for free after a brief informational training and registration process, though visitors should note that some collections are not accessible by the public due to their fragile nature. 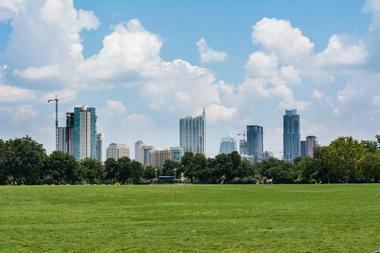 Zilker Metropolitan Park is a 350-acre public park that is located at the intersection of the Colorado River and Barton Creek, named in honor of ice industry entrepreneur Andrew Jackson Zilker, who donated the land to the City of Austin in several sales throughout the early 20th century. The park's land was transformed into a public recreational space in the 1930s through the work of the Civil Works Administration and was added to the National Register of Historic Places in 1997. Today, it offers ample opportunities for seasonal outdoor recreation, including a public hiking and biking trail circling the park's Lady Bird Lake. Public attractions within the park include the Austin Nature and Science Center and the Zilker Botanical Garden, which may be explored for free. The park hosts a wide variety of public special events throughout the year, including the internationally-acclaimed Austin City Limits Music Festival, held over two weekends each October. Historic Oakwood Cemetery is Austin's oldest public cemetery, located near the city's Swedish Hill Historic District along a stretch of land overlooking downtown Austin near Interstate 35. The cemetery has been in operation since at least the 1850s, with many historians believing that its establishment may date back several decades prior. Today, it spans 40 acres and is a National Register of Historic Places-listed landmark, interring some of Texas' most famous figures, including Alamo survivor Susanna Dickinson, Civil War general Thomas Green, and many of the state's past governors and legislators. Historical sections of the cemetery inter the city's Jewish, Latino, and African-American populations, with a "Babyland" section dedicated to infant burials. 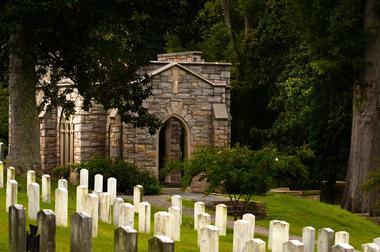 Memorial services are held at the 1914 Oakwood Cemetery Mortuary Chapel, which was extensively renovated in 1944. Bull Creek District Park is a popular 48-acre public park in Austin, overseen by the City of Austin's Parks and Recreation Department. 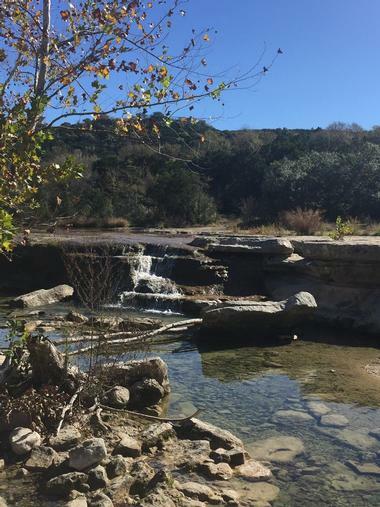 The park was originally established in 1971 around Bull Creek, a tributary of the Colorado River that creates a greenbelt ecosystem for native flora and fauna in the central Texas region. A wide variety of outdoor recreational opportunities are offered at the park, including basketball and volleyball courts and a multipurpose sporting field. Swimming and fishing are permitted at the creek, with hiking opportunities provided at the Bull Creek Trail. Several areas of limestone ridges are also popular rock climbing sites. Well-behaved pets are permitted on leashes at the park. The Ann W. Richards Congress Avenue Bridge is one of Austin's most iconic bridges, crossing Lady Bird Lake at Congress Avenue. The bridge was originally constructed in its modern form in 1910, revising and remodeling prior bridge structures dating as far back as 1869, and originally crossed the Colorado River before its impounding at Lady Bird Lake. In 2006, the bridge was renamed in honor of Ann W. Richards, the state's 45th governor and one of Austin's most prominent citizens. It is best known as the home of the world's largest urban bat colony, with up to 1.5 million Mexican free-tailed bats residing underneath the bridge each summer. 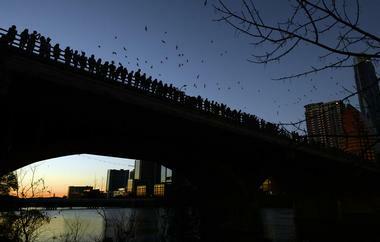 Tourists can observe bat populations flying at dusk for feedings during the summer months, traveling away from the bridge over Lady Bird Lake to the east. An information kiosk on the bridge's bat population is offered along the lake's northern banks at the east end of the bridge. 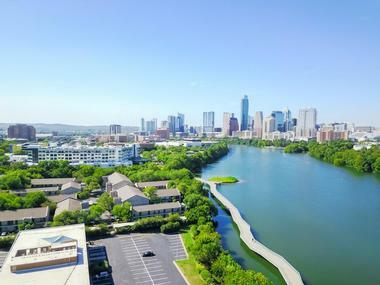 Lady Bird Lake, formerly known as Town Lake, is a manmade reservoir along the Colorado River that was originally created in 1960 with the construction of Longhorn Dam, intended to serve as cooling waters for the former Holly Street Power Plant. In 2007, the lake was renamed in honor of First Lady Lady Bird Johnson, who was influential in cleaning the lake during the 1970s and returning much of its surrounding banks to natural ecosystems. Today, the 416-acre lake serves as one of Austin's most popular outdoor recreational spots, offering biking opportunities at the 10.1-mile Ann and Roy Butler Hike-and-Bike Trail, which circles the lake's banks. Canoe, kayaks, and paddleboards are permitted on the lake's waters, which are frequently used as a practice spot for local rowing teams. Swimming is offered at Deep Eddy and Barton Springs Pools, located on the lake's banks, with fishing permitted at the lake's Red Bud Isle. Public special events held annually at the lake include the internationally-renowned Austin City Limits Music Festival and the Austin Reggae Festival. Mayfield Park is a public park located on the former grounds of the Mayfield-Gutsch Estate, which was originally constructed in 1870s and famously owned by Texas Secretary of State Allison Mayfield in the early 20th century. The estate was developed with colorful walled gardens following its acquisition by Mayfield's daughter Mary Frances and her husband Milton Gutsch, a professor at the University of Texas. In 1971, following Mayfield-Gutsch's death, the cultivated estate gardens were donated to the City of Austin. Today, two acres of the estate's grounds are operated as a public park and botanical garden facility, showcasing beautiful plantings of palmettos and water lilies throughout the grounds' landscaping. 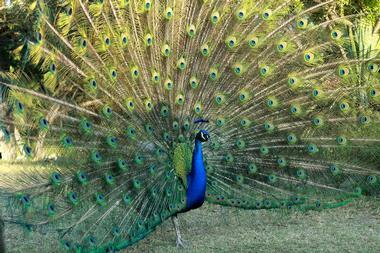 Koi ponds are home to exotic fish, while brilliantly-colored peacocks and peahens freely roam the park's grounds. The grounds are open to the public for free daily from dawn to dusk, with sections available for private special event rental. Sparky Park is one of Austin's most notable public art installations, located on the grounds of a former electrical substation constructed in the 1930s. The station consists of a utilitarian lot and an Art Deco-style municipal building which formerly housed city electrical machinery. Following an overhaul of the city's electrical grid in the mid-2000s, Austin artist Berthold Haas was commissioned to develop a large public art installation to convert the station's grounds into a public park space. Today, the station is decorated with a unique junk art display reminiscent of Spanish Art Nouveau pieces, 1960s psychedelic culture, and 20th-century Midwestern Grotto Culture. The resulting effect is a whimsical stone grotto on the station's grounds, reminiscent of a fairytale land or underwater mermaid grotto. 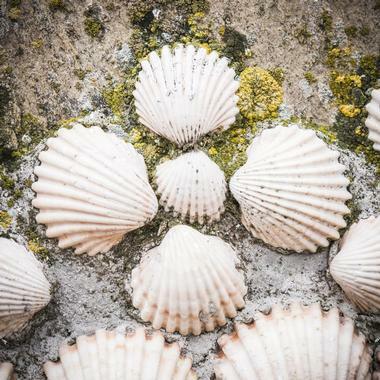 Visitors of all ages are welcome to explore the structure and touch and take pictures of its artistic elements. The Texas State Capitol is Texas' official seat of government, housing the state's legislature and the offices of the Governor of Texas. The capitol building was designed by architect Elijah E. Myers and constructed between 1882 and 1888, with substantial additions and renovations added to the complex in 1993. 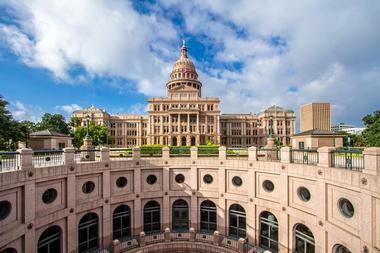 Since 1986, it has been designated as a National Historic Landmark, recognized as the sixth-tallest state capitol building in the United States at a height of over 302 feet. Self-guided tours of the capitol building are permitted seven days a week throughout the day for visitors of all ages, with self-guided tour materials available in eight languages for exploration of the building and its grounds. Docent-led tours are also offered seven days a week at specific times throughout the morning and afternoon hours, departing approximately every 45 minutes and lasting approximately half an hour. Themed tours available at select times throughout the year include a Women in Texas History Tour, an African-American Trailblazing Texas Tour, and a Holiday Capitol Tour in December. Texas American Indian Heritage Day is celebrated each year in Texas on the last Friday of September, designated by the state's legislature as a state holiday to celebrate the social and cultural contributions of indigenous Texas communities to the state's history. 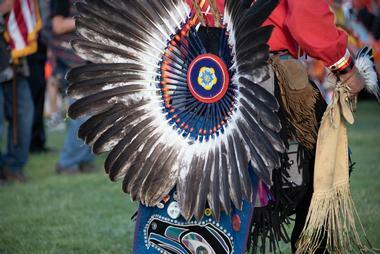 An annual American Indian Heritage Day Celebration is hosted on the holiday at the Bullock Texas State History Museum on the Saturday following the holiday, co-sponsored by the Great Promise For American Indians nonprofit organization. The free-admission festival offers a variety of family-friendly activities and performances celebrating indigenous cultures, including performances of traditional drumming and dancing art forms by local indigenous groups. Festival participants can learn about indigenous cultural traditions at a number of interactive activity stations, including storytelling, cooking, and textile crafting arts. Free parking is offered at the museum for festival attendees. 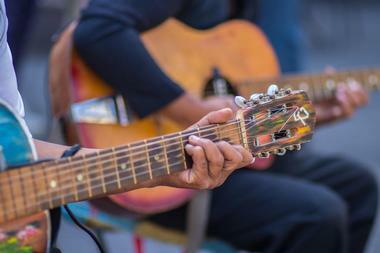 The Texas Community Music Festival is an annual free music festival held each April at Austin's Central Market North, showcasing a diverse lineup of local and regional music performers. Musical artists, bands, and performance groups present performances across a variety of genres, including rock, jazz, world, and classical music. The festival, which was first held in 2006, is sponsored in part by grocery store chain H-E-B and the Austin Civic Wind Ensemble, the city's oldest community band organization. Family-friendly performances are offered over 10 consecutive days, inviting community members of all ages to sing and dance along with performers. A children's play place is also offered at the festival for young attendees. The Texas Independence Parade is an annual celebration honoring the state's official Independence Day, celebrated each year on March 2nd to commemorate the 1836 signing of the state's Declaration of Independence. 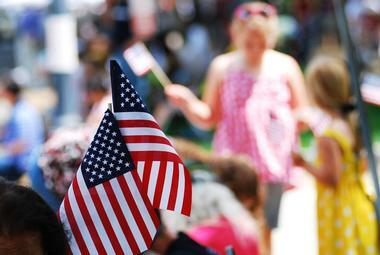 The parade is presented by the nonprofit organization Celebrate Texas and is held in the city's downtown near the Ann W. Richards Congress Avenue Bridge, beginning at 9:30am. A 5K run event is also hosted along Congress Avenue, along with a family-friendly Capitol Celebration held each year at the Capitol Rotunda of the Texas State Capitol Building. Official Independence Day celebrations are also held at the Joseph and Susanna Dickinson Hannig Museum, including an official independence ceremony and a display of festive Texas pride flags and artifacts. 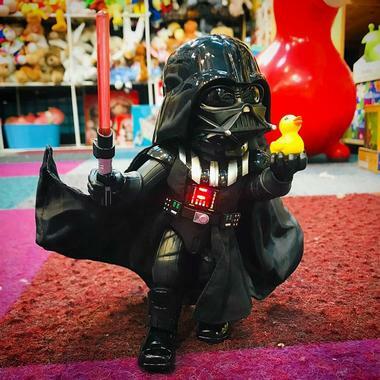 Toy Joy Store is one of Austin's top family attractions, named as one of the top independent toy stores in the world by USA Today and Travel and Leisure magazine. The store was originally opened in 1987 and moved from its original University of Texas district location to a new location in the city's downtown on 2nd Street in 2013. The store is open to the public every day of the year with the exception of major national holidays and stocks a unique collection of eclectic and nostalgic toys and gifts. While the store is a family-friendly favorite, adult visitors will also find much to enjoy, with collectibles and items stocked for both children and kids at heart. Since 2014, the store has been a part of the Wild About Music retail group and has increased its stock of collectible items.